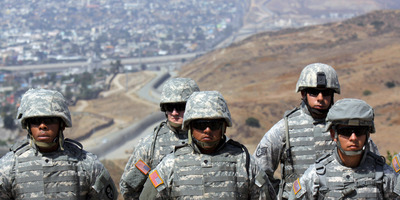 Sandy Huffaker/Getty ImagesNational Guard troops by the US-Mexico border in 2010. Eleven states have ended cooperation with a White House initiative to deploy the National Guard to the US-Mexico border. Massachusetts, Maryland, North Carolina, and Virginia have assets at the border that are now set to return. Seven more states have canceled future deployments. President Donald Trump announced in April that the National Guard would help support his new “zero tolerance” immigration policy. But outrage over images and stories of families separated at the border has led some governors to back out. Eleven US states have canceled agreements to send members of the National Guard to the US-Mexico border as part of a growing backlash over the Trump administration’s policy separating migrant families that illegally enter the US. New York, Massachusetts, and Colorado were the first to pull their forces from current or planned deployments at the border, and they were soon joined by many more. Most are states with a Democratic governor. Two – Massachusetts and Maryland – have Republicans in charge. Massachusetts, Maryland, North Carolina, and Virginia had already sent resources south and are now withdrawing them. The others had planned to cooperate but no longer will. Resistance to the Trump policy has increased in recent days, fuelled in part by photographs and audio of detention centres making into the public domain. Scroll down to see how each state has responded to outrage over the policy. In an executive order on Monday, Gov. John Hickenlooper barred state resources from being used to separate immigrant families. He also called on the Trump administration to reverse the practice of family separation. Gov. Dannel Malloy condemned what he called the “inhumane practice” of separating families. “This vile practice must end,” Malloy said. Gov. John Carney said he had refused a request to send troops on Tuesday. Carney said that if Trump changed the zero-tolerance policy, then Delaware would help once more. Gov. Larry Hogan recalled a National Guard helicopter and four service members. “Until this policy of separating children from their families has been rescinded, Maryland will not deploy any National Guard resources to the border,” he wrote on Twitter. Gov. Charlie Baker called the administration’s policy “cruel and inhumane,” becoming the latest in a string of Republican figures to criticise the president. Baker had decided to deploy troops earlier this month, following a proclamation signed by Trump in April that ordered National Guard troops to help protect the US-Mexico border. “Ever since our founding – and even before – our nation has been a beacon for families seeking freedom and yearning for a better life,” Gov. Phil Murphy said on Tuesday. Today I signed an Executive Order declaring that no state resources will be used to assist in the Trump administration’s cruel policy of separating children from their parents. This policy is an affront to our values as New Jerseyans and as Americans. “In the face of this ongoing tragedy, let me be very clear: New York will not be party to this inhumane treatment of immigrant families,” Gov. Andrew Cuomo said. North Carolina will withdraw three National Guard members from the border, Gov. Roy Cooper said on Tuesday. Gov. Tom Wolf tweeted on Tuesday that he opposed state resources being used as part of the family-separation policy. “While PA proudly sent troops to TX, FL and Puerto Rico for disaster relief and I believe we need to protect our borders from real threats, I oppose state resources being used to further Pres. Trump’s policy of separating young children from their parents,” Wolf wrote. In a statement on Tuesday, Gov. Gina Raimondo said her state would not send National Guard resources to the border if asked to do so by the administration. Gov. Ralph Northam on Tuesday said he would withdraw one helicopter and four service members from the border. “When Virginia deployed these resources to the border, we expected we would play a role in preventing criminals, drug runners, and other threats to our security from crossing into the United States – not supporting a policy of arresting families and separating children from their parents,” Northam said.